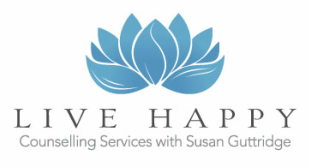 Live Happy Counselling is a place for individuals to access counselling in an atmosphere of tranquility and respect. I presently work with adults and youth (ages 8+), providing individual and group therapy. I believe that therapy works best when you feel comfortable with your therapist and understand their approach to counselling. Feel free to e-mail or call if you have any questions prior to scheduling your session. and various Employee Assistance Programs. Please provide at least 24 hours notice if you can not attend your scheduled session time. Half the cost of the session will be charged for no-show and missed sessions without 24 hour notice. Funding agencies do not cover the cost of missed sessions, so please let me know in advance if you can not attend your session so that you do not accrue unnecessary costs. If you need to cancel or change your session time, please contact me by telephone, text, or e-mail. Ready to get started? Give me a call, or send me an e-mail. We will start out with a brief discussion to ensure my expertise is a match for your needs in counselling, and then schedule an intake session. ​Looking for a good read? Here is a list of books I frequent reference or suggest to clients.